I saw a prompt somewhere asking, “If you could eat Thanksgiving dinner with some of your favorite authors (living or dead), who would you choose?” So here are my choices. 1. William Shirer – Because he’s an excellent historian who witnessed the rise of Nazi Germany firsthand, I think he’d have plenty of interesting stories to tell. 2. 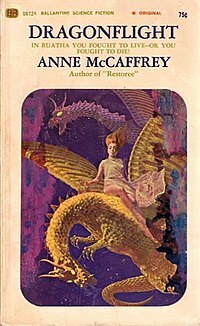 Anne McCaffrey – She recently passed away on Monday at the age of 85, and she was one of my favorite authors. It was because of Ms. McCaffrey that I became obsessed with dragons and the fantasy genre. It would be great to hear about what inspired her to invent the worlds she created. 3. Emily Dickinson – I’ve always been fascinated by Emily Dickinson – and the meaning behind some of her more obscure poems. Perhaps if I had her over, she could shed a little light on the subject. 4. Tanith Lee – The Gothic style of her writing has always intrigued me. She can create multi-layered worlds with compelling characters, some demonic and some angelic. I think Ms. Lee would be a rather fascinating person to invite. 5. Michael Savage – Because political rants are sometimes amusing to listen to. Even though I don’t agree with every word Savage says or writes, I think it would be interesting to hear him converse with some of these other authors.